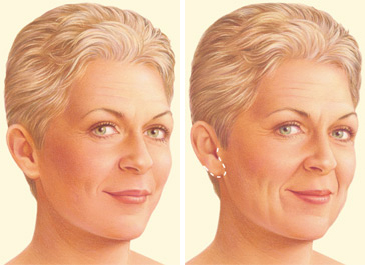 Indications for a facelift include sagging facial skin and jowls and loose neck skin. The usual candidates are men and women over the age of 40 years. Performed under either general or local anesthesia with intravenous sedation, the procedure takes several hours. You should expect to experience temporary bruising and swelling. The facial skin may feel numb and tender, as well as dry. Typically, you will have a "tight" sensation in the face and neck. Risks include bleeding, infection, excessive scarring, asymmetry and an undesirable hairline change. Occasionally, injury to the nerves controlling facial muscles and temporary numbness occur. When injury does happen, it usually resolves, but on rare occasions, it is permanent. Poor healing is another possible risk. 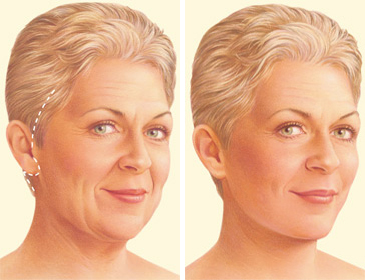 After a facelift, you generally can resume work in 10 to 14 days and more strenuous activities within two to six weeks. Sun exposure should be limited for several months, and you should always use sunscreen. The effects of a facelift typically endure for five to 10 years. Traditional facelift incision often begins in the hairline at the temples, continues around the ear and ends in the lower scalp. Fat may be sculpted or redistributed from the face, jowls and neck, and underlying tissue is repositioned. Commonly, the deeper layers of the face and the muscles are also lifted. Skin is redraped over the uplifted contours and excess skin is trimmed away. A second incision under the chin may be necessary to further improve an aging neck. Sutures close the incisions. An alternative to a traditional facelift uses shorter incisions at the temples and continues around the ear. The incisions are usually closed with dissolving internal sutures and external sutures that are removed. Once healed, the incision lines from a facelift are well concealed within the hairline and in the natural contours of the face and ear. During your facelift recovery, a bandage is usually placed around your face to minimize swelling and bruising once your procedure is completed. Thin tubes may be present to drain any excess blood or fluid that may collect under the skin. You will be given specific instructions that may include how to care for your incisions, specific concerns to look for at the surgical site and when to follow-up in the office. The decision to have a facelift is extremely personal. You will have to decide if the benefits will achieve your goals, and if the risks and potential complications of a facelift are acceptable.